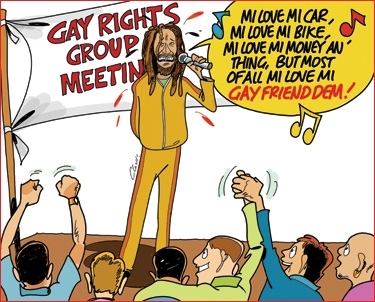 It's no secret: there's a war going on between the "Gay Rights Activists" and Dancehall artists/fans and it has to do with the fact that in Jamaica homosexuality is illegal and rejected in the Bible as well. 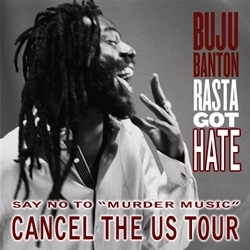 One major target for the calls to boycott Reggae/Dancehall and Jamaica is Buju Banton. His latest tour saw many "Gay Rights Activists" fighting fiercely not only against Buju Banton and Dancehall music, but even against Rasta. In a dirty play on the title of Buju's latest album "Rasta got Soul", they've dubbed their hate-campaign "Rasta got Hate" (See left). The "Gay Rights" movement was -until a few days ago- working very hard to get Buju Banton out of a job. The fact that his latest album was nominated for the Reggae Grammy Awards had made them furious as hell. So furious, that Buju reportedly got attacked with pepper spray after having a meeting with representants of the "Gay Rights Activists" in San Francisco. It's no secret what the "Gay Rights Activists" want. It's actually pretty well pictured in the pictured cartoon (right). Even though the pictured situation is too absurd to view as realistically possible, what did happen in reality came close. Now you can visit websites where under headlines like "Buju Banton's violations of the Reggae Compassionate Act" you can find all kind of "evidence" and even "proof" that Buju sinned against the dictate called Reggae Compassionate Act. It's all about his "Boom Boom Bye Bye" tune, an anti-homosexual tune he wrote when he was still a teenager and which then went on to live a life of it's own, hunting Banton until this very day. Yes, that one is for certain: Buju Banton is hunted down by forces of Babylon on many levels. Hunted down by what can be called a mob, with their mind set at destroying Jamaica and Reggae Music, starting with Buju Banton. A mob which presents themselves on websites, like that one which has the Jamaican flag with a bloodstain on it. In even more great news, murder-music Grammy nominee Buju Banton is currently sitting in a federal lockup in Miami, charged with conspiracy to possess with intent to distribute more than five kilos of cocaine. Because I'm a nice person, I will charitably say no more. Except this ... MWA-HA-HA CHORTLE CHORTLE GUFFAW! The view of Buju Banton in an American prison, where if called guilty he can face up to 20 years, apparently does not trigger any compassion by the ones who dictated to Rastas and Dancehall vocalists just what "One Love" is and boasted how "compassionate" they are, that's for sure. At the moment this article is written, there is not anything known about just when Buju Banton will go before a judge, if or when he can get bailed out, but we'll keep you posted.